Former Islander teammate Garry Howatt nicknamed Bryan Trottier and his super-sniper cohort Mike Bossy "bread and butter." This wasn't totally because the dynamic duo was the dynastic Isles' bread and butter during they hey days (with all due respect to many others, particularly Denis Potvin and Billy Smith), but because the two were almost inseparable both on and off the ice. The two went together like bread and butter. Bryan, of course, was the center of attention during the New York Islanders dynasty of four straight Stanley Cup wins in the early 1980s. Literally. He centered Bossy along with a host of left wingers, most notably one of the most fearsome figures in hockey history in Clark Gillies, to become one of the most potent scoring combinations in league history. Trottier and Bossy had an uncanny partnership, as the unselfish Trottier perfectly set up Bossy, arguably the NHL's best sniper ever. "Its instinct," said Bossy while trying to find the words to describe their on-ice relationship. "There aren't any little signals. The thing between us is the communication we have. We're not afraid to tell each other that we should have done this, or we should have done that. As much as Bryan helps me, I've helped him." "I think history will remember Trots as a great hockey player," said Bossy, "and me as a great goal scorer, not a great hockey player. I can't say who's better because we were so different. Any team that needed a strong and determined center who could score and check and win face-offs would naturally choose him over me. Any team that needed somebody to score goals would choose me over him." That pretty much sums up Trottier as a hockey player pretty nicely. Although he once led the league in scoring, had 6 100 point seasons and 2 more over 95, and once scored 524 career goals, and 1425 career points, he isn't remembered for his great offensive numbers. That tells us just how great the rest of his game was. To dwarf those incredible offensive statistics is no easy feat, but when people remember Trottier they talk about him being perhaps the most complete player in the history of the game. As incredible as his offensive wizardry was, his dogged defensive play and gritty physical play was equally as impressive - and perhaps more so. .
Bryan was born just outside of a small town in Saskatchewan named Val Marie - just north of the Montana border. Like most of the kids in the area, Bryan grew up honing his skating and puck skills on the frozen ponds during the long Saskatchewan winters. But Bryan took the game more seriously than the others kids - he would stay out on the ice and practice when everyone else gave up due to the frigid temperatures. Sometimes the only friend Bryan would have out on the ice was his pet border collie. Bryan noticed that the dog liked to put the puck in its mouth, so Bryan took that opportunity to practice his shot - with the collie acting as a make-shift goaltender. By 1972 Bryan was old enough to begin advancing his career. He travelled 75 miles down the road to Swift Current where he joined the WHL Broncos. He started out slowly, but quickly became one of the hottest prospects in the league. Playing with the likes of Terry Ruskowski, Tiger Williams and Brian Sutter. 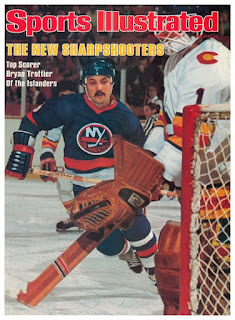 In the 1974 NHL Entry Draft, Trottier was selected 22nd overall by the Islanders. He was returned to junior (by this time the Swift Current Broncos had moved to Lethbridge) for some more apprenticeship - a move that paid off very well. Trottier led the entire WHL with 98 assists, which coupled with his 46 goals and 144 points earned him 2nd place on the overall scoring list and he won the WHL Most Valuable Player Award. Trots broke into the National Hockey League in 1975 with the Islanders, winning the Calder trophy as the leagues best rookie. "Its his poise that really stands out," said teammate Billy Harris during Trots rookie year. "He's always calm, regardless of the situation. And he's got tremendous hockey sense. He is, if there is such a thing, a natural born center." "Trots" had 32 goals and 63 assists, which set a then-rookie-record 95 points. But that was just the beginning for Bryan. Three short years after arriving in the NHL in such grand fashion, Trots captured the Art Ross trophy as leading scorer and the Hart trophy as MVP. Many people expected the Islanders to finally become the team that would upset the Montreal Canadiens and become hockey's new best team, but that would have to wait a year as the cross town rival NY Rangers upset the Islanders in the playoffs. However the following year the Islanders would finally reach the top, winning their first Stanley Cup in their history. And they wouldn't let go of their championship, holding it for the next 4 years before the Oilers dynasty managed to wrestle it away from them. That first year it was Trottier who was named as the MVP in the playoffs, earning him the Conn Smythe Trophy. While Bryan got used to lifting the Stanley Cup over his head, it was the first one that is always the most special. "When I was holding the Cup," he said "I could feel all the names. My senses peaked. I could hear everyone. The crowd was incredible, one continuous roar.". The 4 time All star Trottier's best years came during the height of the New York Islanders dynasty. 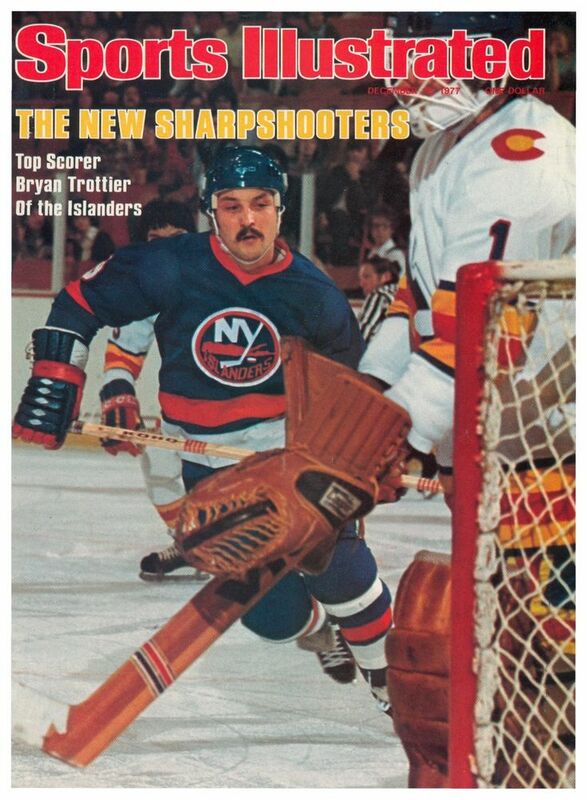 For the 4 years that the Isles reigned as the NHL champions, Trottier was arguably the best player. Famed hockey writer Stan Fischler made it his personal campaign to let everyone know that he felt Trottier was better than the young whiz kid in Edmonton named Gretzky. In fact Fischler once said "Trottier has ripened into the most effective total forward since Gordie Howe." Teammate Eddie Westfall agreed with that assessment. "He's rugged like Howe. Gordie liked to play a physical game and so does Bryan." Another old timer Trottier was often compared to was Boston Bruins 1940s and 50s standout center Milt Schmidt of the Boston Bruins. A modern comparison would be Steve Yzerman. The fact that Trottier scored over 500 career goals and 1400 points in 1200 games is amazing, as it often seemed that Trottier was more interested in such intangibles as body checking and defensive attention. Isles coach Al Arbour had a much easier job when Trottier was in the lineup, and agreed that in the early 1980s that Trottier was the league's best center. "Gretzky is an offensive genius for sure," said the slightly biased Islanders bench boss. "But at this stage Trots gives you more things. Defensively, he's outstanding. And he's physically tough. He comes up with his 100 points a year, automatically, along with everything else!" Arbour once also said he'd never trade Trottier for Gretzky. Hulking defenseman Larry Robinson was another fan of Trottier's. "What you don't realize is that Trottier weighs over 200 pounds. You can't budge the guy of knock the puck off of his stick. And he hands out a lot of punishment at close quarters." Trottier remained with the Islanders through 1990 season, making him the last piece of the championship puzzle to leave Long Island. By then he was clearly nearing the end of his career - his offensive stats had dried up and he was relying on his leadership and defensive abilities. After all those years with the Islanders, Trots would join the Pittsburgh Penguins late in his career. With his leadership and experience, he helped Mario Lemieux and company win two consecutive Cups, bringing his total to 6 championship rings. Trottier retired after the 1992 championship, and returned to Long Island to work in a front office position. But after one year off of skates, Bryan returned to the game, again with the Penguins. He played in just 41 games to round out his career. Trottier was overshadowed by glitzier stars like Guy Lafleur, Wayne Gretzky and Marcel Dionne. He was even overshadowed on his own teammates like by Mike Bossy, Denis Potvin and Billy Smith, and later Mario Lemieux and Jaromir Jagr. But make no mistake, Trottier is a legend of hockey. Trottier could do it all. He was gifted scorer who could also neutralize the other teams big guns. An excellent face off man, he was also a relentless body checker, slamming into opponents at any given chance. If there was a hockey dictionary and you looked up the term "complete player," it would have a picture of Bryan Trottier beside the definition. I lived on Long Island all through Trots' career. He was the best two way player in the game. Offense, defense, scoring, passing, checking, faceoffs, Trots had it all. It's not enough to say his game had no weaknesses. He was outstanding in every aspect of the game. That's what makes him the best all around player that ever played the game.